The Impossible Burger is a meatless burger that "bleeds", sears, and tastes like a real beef burger. The creators of the Impossible Burger spent five years researching the texture and flavor of beef, resulting in a rich, decadent meatless burger that will satisfy vegetarians and appeal to meat eaters. 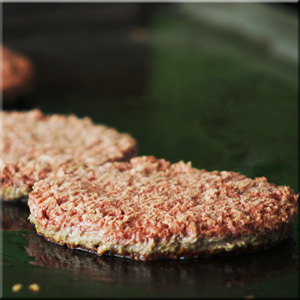 The ingredients include: (1) soy protein for firmness, chew, and a more "meat-like" texture, (2) potato protein allows the burger to hold water and transition to a more solid state during cooking (it can be cooked to any temperature), (3) a blend of coconut oil and sunflower oil for fat, (4) Methylecellulose, a plant-based cullinary binder, to make it easier to handle both raw or cooked and to make it juicer, and (5) heme for the "meat" flavor and “bleeding” effect. Heme is an iron-containing molecule that occurs naturally in plants and animals. The protein, iron, and fat content are comparable to conventional 80/20 ground beef. Bulk Ground- great for meatballs, tacos, a variety of ground meat applications, "meat" sauces, customizing the form and thickness of your patties, and more. Available in a 20# case.